After 3 weeks of enforced D-Tox from alcohol & boxing on doctor’s orders, I’m hoping to get back to normal soon. Though I have to admit that I absolutely loved every single second of doing nothing. In your face you Mexican Virus!!! But that’s not all I picked up from Mexico. Chamoy candy and a variety of Mezcals traveled all the way back to the east coast with me and I consider it my duty to show them a good time. Full disclosure :I’m more of an “on the rocks” over “frozen” kinda girl. But the temperature around here is rising a bit too much for comfort and my child’s popsicle obsession got me thinking outside the box. More like outside the cocktail shaker in this case. So while I was making him some fresh fruit pops, I decided to make myself some “grown up” ones. Best decision of my life. Wanna try one? 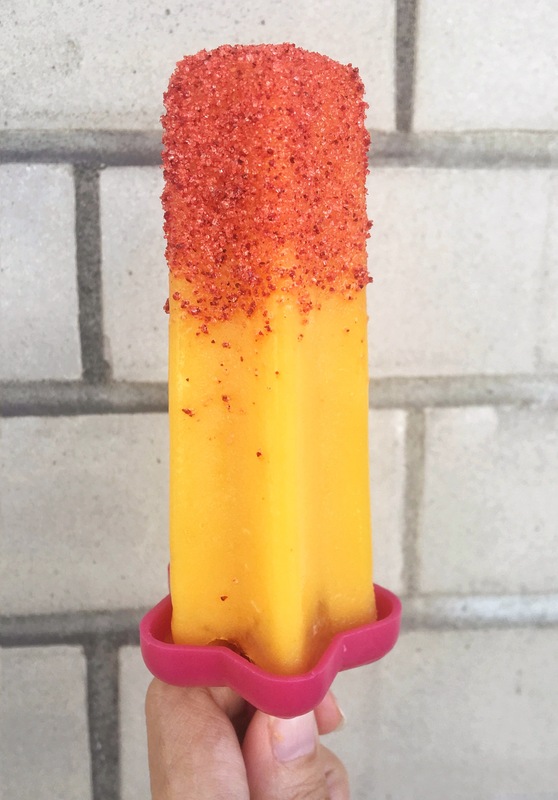 In a blender, blend all of the ingredients except the Chamoy Spice. Tip: Fill the mold almost to the rim leaving room for approximately 1 tbsp of water/canned mango juice. As water freezes a lot harder than fruit pulp/alcohol, adding water or juice on top near the handle ﻿will make pulling out the frozen pops a lot easier. Previous Post That’s Totally Nuts!